Moon Days Calendar - your small adviser for every day! 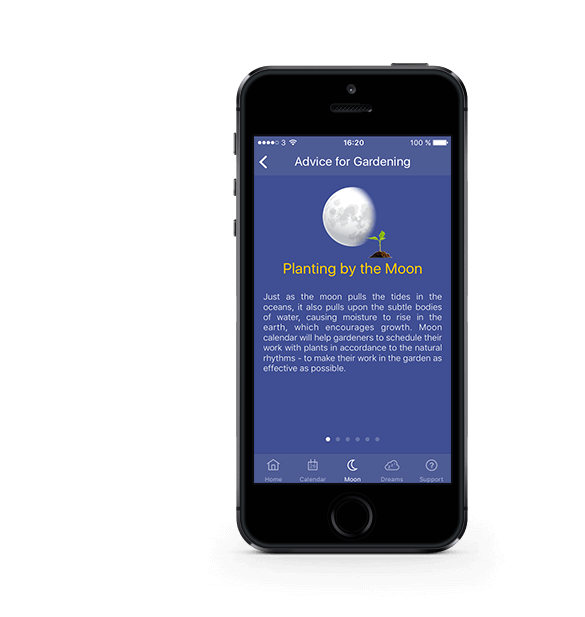 Moon Days Calendar gives advice and recommendations for every day! Use the influence of the moon, its phases and other planets to plan ahead and succeed! In Moon Days Calendar you can read more about the influence of the moon and moon's phases, influence of planets, interpretation of your dreams, useful advice on how to choose good days for different things, how to create plans, favorable and tense periods of the year and advice for gardening. 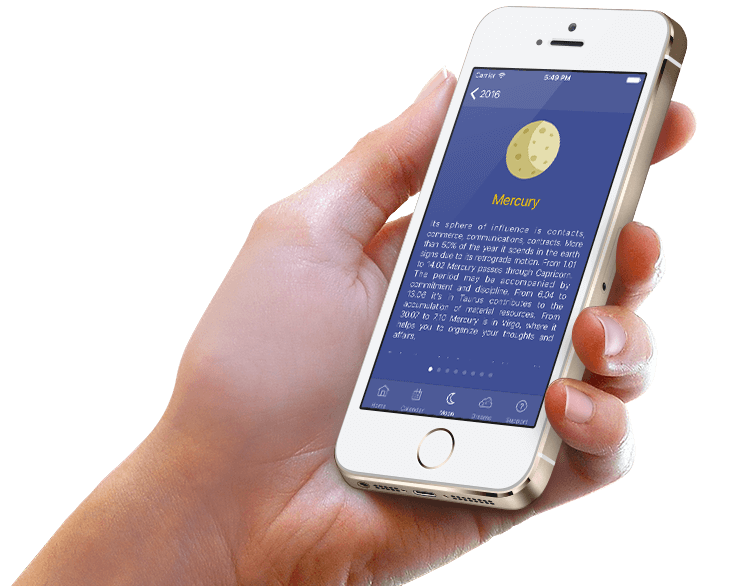 You also can read detailed description about lunar, solar days for every day and advice for each month! The human body is built with the same elements as the Earth, the planets and the stars. This creates a close link between the human and stellar bodies. All planets have its particular influence on us. The most powerful planets are Mercury, Venus and Mars. Correct your plans in accordance with their influence to receive help from planets in achieving your goals. It's scientifically proved that the moon has influence on Earth and on people. During the crescent moon you feel more energy and it's recommended to start new affairs in this period, but during the waning moon you can experience lack of energy, bad mood, it's the best period to finish current affairs. Adjust your lifestyle following moon's phases to achieve better results! If you plan to start a new business or important affair, get married or have new romantic relations, plan to have a big purchase or luxury stuff, create plans - then you will find very useful our recommendations for choosing good days and periods. Use the energy of the moon in your favor. 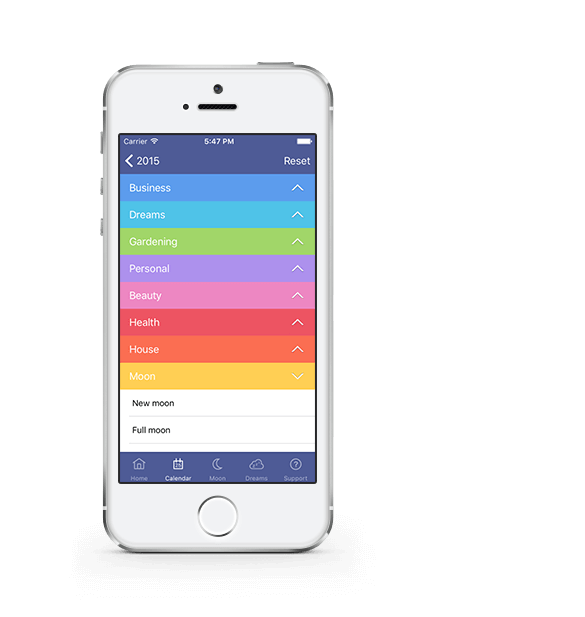 It also helps you to plan your trips, vacation, cosmetic procedures and a lot more. After we study the calendar attentively, we can plan better when to go in vacation or when is favorable to apply for a new job. The calendar doesn't do anything for you, but its' advice and recommendations can significantly simplify your life! As the Moon pulls the tides in the oceans, it also cause the water to rise from the earth upon the subtle bodies of plants. Learn when is the best time to plant seeds, to remove weeds, to plant flowers, lawns and when is favorable to collect crops. In the introduction we describe shortly the main features of the calendar, the meaning of different symbols and some instructions about how to use the calendar. All time that you will meet is already automatically calculated according to your time zone. Sometimes we are waking up and trying to analyze our dreams, guessing what they can mean. So in our app we have a collection of more than 2000 words. Also there are days when your dreams are prophetic or have no particular meaning, sometimes they indicate some problem in our lives. You can significantly simplify the process of choosing favorable days for different things applying correspondent Filter. It can be business, health, beauty, dreams, personal, gardening and others. 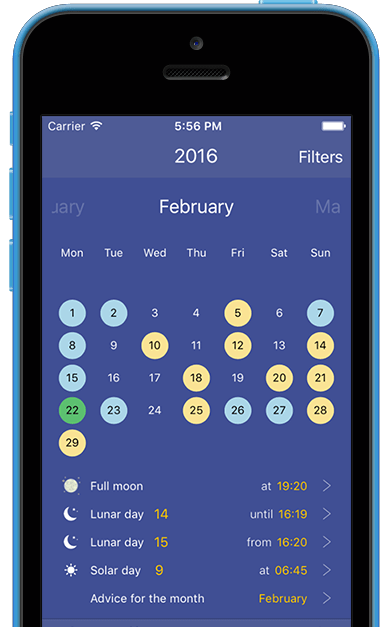 After choosing one of them you will see highlighted days in the calendar for chosen category. Check good and bad days for every month, the detailed description of each day to go with the flow and not against it! In the description of lunar days we present general characteristic of the day, advice for business activity, health warnings (which organs are the most vulnerable in that day), short description of dreams. We also have information about moon's phase - new moon, crescent, full moon, waning that occurs once a month, and information about solar and lunar eclipses. 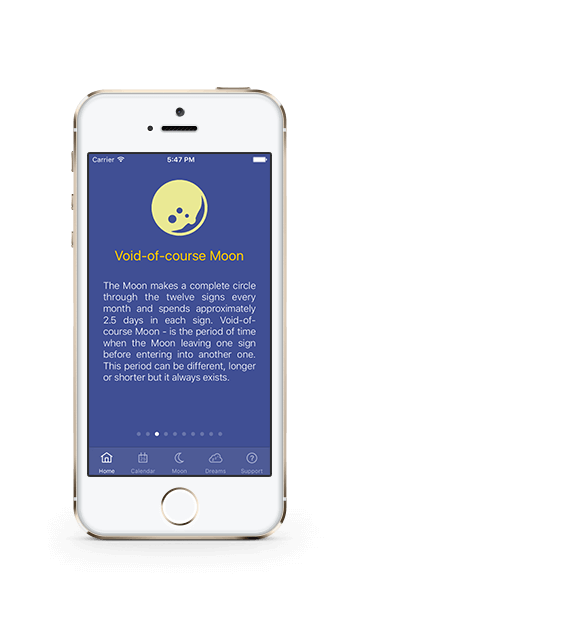 Read more details in the Moon's phases screen. Sun has also its influence on people. You can read concise description of each solar day where you also can find some recommendations and information about stone of the day, its meaning. Useful advice, recommendations and warning about good and bad periods in the month, recommendations for health, advice for cosmetic procedures, gardening, house and a lot more. 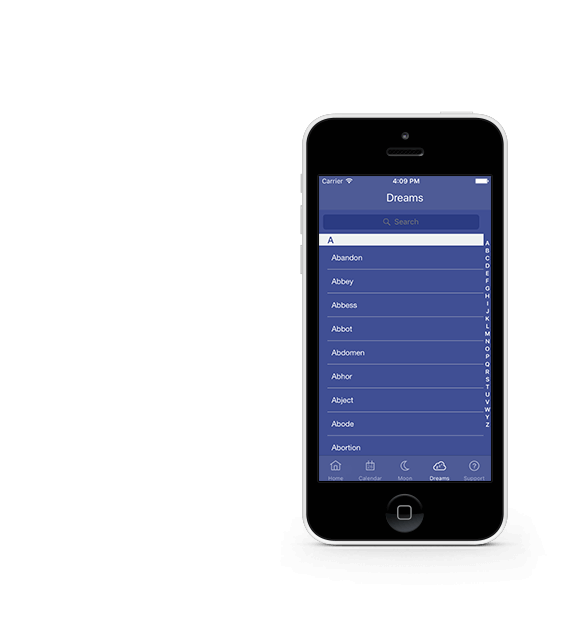 And receive news and promotions about our app.